PASCAGOULA, Miss., Nov. 17, 2005 (PRIMEZONE) -- The U.S. Coast Guard honored a Northrop Grumman Corporation (NYSE:NOC) shipbuilding team for their Hurricane Katrina recovery performance on the first Deepwater National Security Cutter. Northrop Grumman's Ship Systems sector resumed shipbuilding just two weeks after Hurricane Katrina. The company is building the National Security Cutter at their Pascagoula facility, under contract from Integrated Coast Guard Systems LLP, a joint venture of Northrop Grumman and Lockheed Martin Corporation. U.S. Coast Guard Rear Adm. Patrick Stillman, program executive officer for the Integrated Deepwater System program, praised the shipbuilding team, saying, "What you have collectively experienced here with Katrina and the challenge of coming together in order to infuse your character, competency, commitment and most of all your sense of community into the decks of this ship is a legacy. It is a legacy that will take young men and women to sea and mold their character as yours has been molded in confronting the challenges that mark our existence." 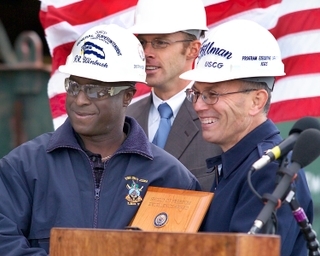 Stillman toured the ship with shipyard management and acknowledged the efforts of 30 shipbuilders by presenting them with Deepwater Awards for Excellence. The awards read, "We are pleased to commend you for your exemplary performance of duty while assigned to the Integrated Deepwater System program and team during the recovery and restoration efforts resulting from Hurricane Katrina." "I can't thank you enough for what you've done," Stillman said, at the end of his tour. "There is no question in my mind that this ship will sail carrying a standard of excellence that is unrivaled because of you." The National Security Cutter will be a 418-foot ship with a 4,300-ton displacement at full load. Powered by a twin-screw combined diesel-and-gas turbine-power propulsion plant, the National Security Cutter is designed to travel at 28 knots max speed. The cutter will include an aft launch and recovery area for two rigid-hull inflatable boats; a flight deck to accommodate a range of rotary-wing manned and unmanned aircraft and state-of-the-art command-and-control electronics. Deepwater is a critical multi-year, multi-billion dollar program to modernize and replace the Coast Guard's aging ships and aircraft, and improve command and control and logistics systems. It is the largest recapitalization effort in the history of the Coast Guard. Northrop Grumman Ship Systems includes primary operations in Pascagoula and Gulfport, Miss. ; and in New Orleans and Tallulah, La., as well as in a network of fleet support offices in the U.S. and Japan. Northrop Grumman Ship Systems is one of the nation's leading full-service systems companies for the design, engineering, construction and life-cycle support of major surface ships for the U.S. Navy, U.S. Coast Guard and international navies.